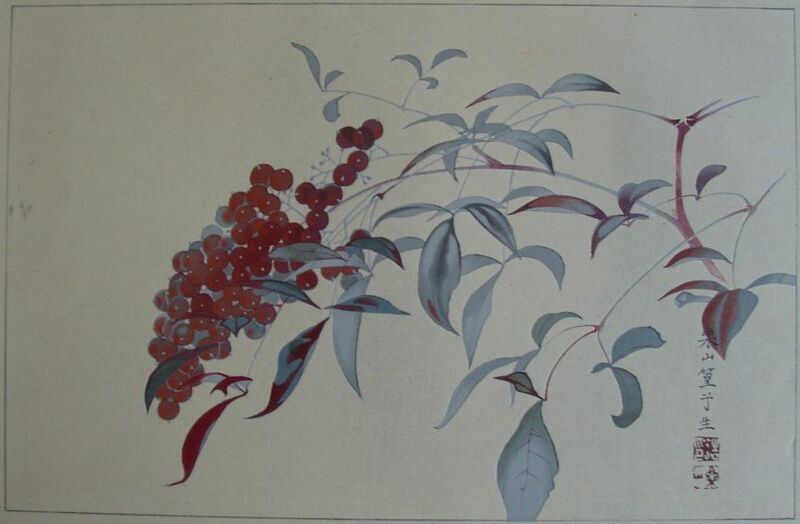 Indentification of this design as number 119 is original to Rakusan who designated this woodblock print as the 119th design published in his main sequence. However, 119 is actually the nineteenth of thirty-six woodblock prints in Rakusan's second main sequence series, 篁子生画選, Koushisei Gasen, lit. 'Koushisei's Print Selection' (usually called here the 36 Series). The woodblock print of 119 was adapted from an actual-size original painting on silk. All of the original prototype paintings for this series are currently in a single private collection. Like most 36 Series designs 119 has the same signature and seal combination on every copy, and it is known from only one color and technique morph. Therefore, for 119 only a single extended edition I can be distinguished. It is usually only possible to date an individual loose print of 119 with edition I markings by listing approximate potential ranges of 1934-1941 and 1948-1955. Unusually, 119 is not printed on plain paper. Instead the paper has a thin spongy coating which incorporates shiny particles, presumably powdered mica. The particles on some copies appear silvery and on others pearly white. The binder is as yet unidentified, and it most resembles the feel of a thin coating of styrofoam. The coating covers only one surface of the paper, and the woodblock printing was done on top of this coating. The same coating is also used for some morphs of 121, and since both 119 and 121 are of winter subjects it is possible that the coating is meant to suggest a background of ice or snow. Edition I: Harvard Art Museums (Arthur M. Sackler Museum), Cambridge, MA, USA; (1941.57) [illustrated online]. The Rakusan project which produced 篁子生画選, Koushisei Gasen, resulted in two related series of woodblock prints. Each print of the 36 Series is intimately connected to a group of prints with the same subjects in the Fan Series. Together these subject-related prints in the two series constitute a theme. Each theme normally consists of a quintet of monochrome Fan Series designs (one design in each of the five fan shapes), plus one polychrome, 36 Series design which illustrates the theme subject. The theme is labeled here by the original Rakusan number of its 36 Series design followed by the subject. 119 is the 36 Series design of the 119 Nandina theme. The Fan Series delivery documents for installment six in September 1934 announced that nandina designs would be published the following month. Those for installment seven confirm that the Fan Series of the 119 Nandina theme were printed during October 1934 and distributed October 15, 1934 as part of installment seven (of twelve). On both sets of delivery documents Rakusan used the theme subject title 南天, nanten, 'nandina', which is the original title of 36 Series design 119 published at the same time. All three themes 119, 120, 121 of installment seven have irregular numbers of Fan Series designs. As a result of a late decision to merge two incomplete themes, Rakusan was left with eight Fan Series designs in theme 121. Making the installment quota of fifteen designs in three themes meant shorting the other two themes in installment seven. Normally Rakusan would have infilled the missing Fan Series designs in all four original themes with seal B designs just before publication. However, the solution he adopted here meant that no Fan Series infilling was necessary. The four Fan Series designs in the 119 Nandina theme have seal C which indicates carving dates between the last months of 1933 and the end of the first quarter of 1934, and a design with fan shape 2 is missing. However, since the 119 Nandina theme still lacked a 36 Series design, 119 was carved with seal B somewhat later and perhaps just before publication. It is probable that 119 was adapted from sketches originally created in the late 1920s for design 1 of the earlier 100 Series (see below). In addition both of the finished designs make use of metallic inks to highlight the leaves.